In spite of a dark, dreary and rainy day, I had the pleasure of attending a fantastic lecture this afternoon at the University of Toronto’s Pontifical Institute of Medieval Studies. Part of Medieval Book History Week, today’s session invited Oxford scholar, Jeremy Catto, to speak about Latin and the evolution of vernacular English in the Middle Ages. This paper focused on practical communication in English, which is any item of writing intended to lead to action. Catto also spoke about the reconstruction of the languages spoken in 1300, and the transformation of the English language around 1380, not solely Chaucer, but practical everyday speech. Catto examined a Latin state account from Yorkshire drawn up in 1328 and followed the history of the English language backwards from 1425 to its beginnings. Written language and spoken language often differed. When a language didn’t provide the spoken form of a word, another word was borrowed from other languages and such was the case with the English language. In the past, in the Ottoman Empire, Persian and Arabic were spoken in the courts, and Turkish in the armies. In England,by 1050, Old English was well on the way to creating a wide and expressive vocabulary, full of rhetorical tropes. It was employed perfectly well in practical communications, law documents, and writing. However, elaborate written Old English didn’t last long after the Norman Conquest – it ceased to be used in documents by 1070. The last person known to be able to write in Old English lived in 1180. By the end of the 13th century, manuscripts from Old English were marked down as, “in an unknown language”. English texts of the three centuries after the Conquest were very carefully written out; free of abbreviations. Scribes wrote very carefully in what was perhaps an unfamiliar medium. The other vernacular language used in England was French. There is a good argument stating that written French was an English invention. This idea was due to the English needing to learn the language of their invaders quickly. By 1250, French ceased to be a spoken language and was used primarily as a courtly language and in formal documents – it was no longer native but still had to be learned. The difference between French and English was that Latin was much easier to translate into French. The burgeoning need to have a quick and easy language caused a rapid development in Latin. Classical Latin was no longer very useful – for example, the progression of medicine and law demanded new words be created to accommodate these growing professions. Thousands of Latin technical terms came into usage. This new Latin lacked the elegance of Classical Latin but allowed for the development of law and medicine and other professions such as weaving and dyeing. It was an indispensable adjunct to mediaeval civilisation. How widespread was the use of practical Latin? Numerous school texts survived with glosses. Vernacular glosses were written as prompts for the teacher, not so much for the pupils. Literacy and Latin before 1350 worked together through texts like the Pater Noster. There is a body of over ten thousand accounts written in Latin that demonstrate the widespread use of Latin. Written texts were put together by legal practitioners who were increasingly needed after 1200. Manorial or state accounts did not appear to be in the hands of lawyers. These tracts dealt with tenants, assessed crops, etc.. and indicated someone who participated in an outdoor profession. This implied they must have been drawn up in a standard Latin by state officials. Catto pointed to the account written by a Yorkshire Reeve in 1327/28. The accounts show it was put together from small properties; a patchwork estate Its basic product was grain, wheat, barely and oats, all sent to market. There was wool and market gardening as well, and it also included an account of labour costs. The Reeve must have had an abundance of farming skills, and also had to account for all the activities in Roman numerals and in Latin. The account was limited to a rather technical Latin. Everything about this document was practical, and went no further than absolutely necessary to conduct business. The Reeve had to take personal responsibility for these accounts and therefore, undertook to write them himself. Who read this account? The Lord of the manor. He needed to check the arithmetic to ensure no loss of profit, and to keep the respect of his officials. These tasks could not be delegated because any delegation risked embezzlement. The Latin of the accounts was a framework language, retaining the syntax and basic language which made it easy to learn. This was no clerical culture. This account, and the ten thousand accounts were indicative of a lay literacy. This is not to say every person was literate but it demonstrates this was not a Latin you had to go to a monastery to learn. In the gaps of the Reeve’s account, you can see pen trials and where someone tested their writing ability. This ‘practice session’ occurred a few years later once the document was no longer relevant. It dates to around 1340 and Catto suggested it may have been the Reeve’s son. The practice of keeping accounts continued throughout the 14th century and afterwards. A century after 1328, there was a significant change – it was possible to send business communication in English. 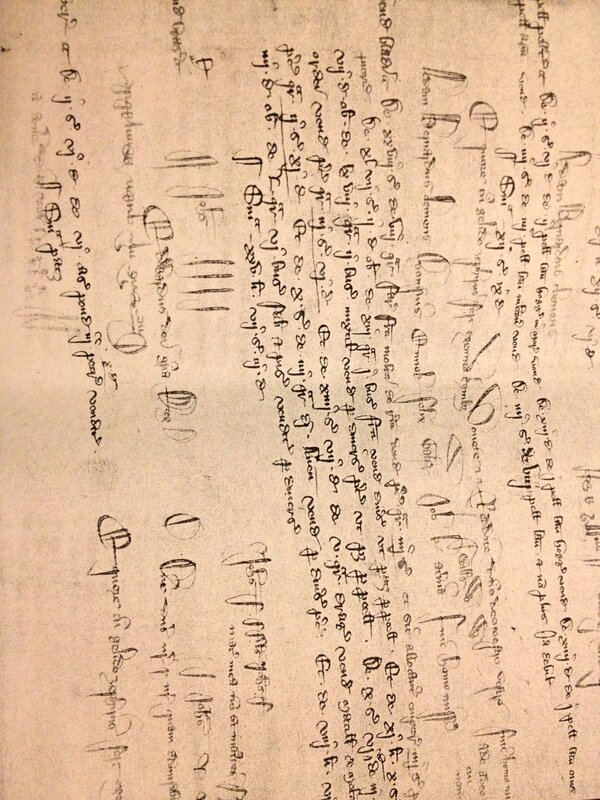 Catto pointed to the 2nd page of his handout where there were copies of letters from Yorkshire family lawyers, and family members around 1425. They showed that written business in English had matured and was fit for purpose. He also provided several 1417 letters from Henry V in English. The reason for writing in English was not nationalism, as had been supposed by some scholars, but to make the correspondence less comprehensible if they fell into enemy hands, i.e., the French. Other samples were produced; handouts of letters, shopping lists and covering letters. These types of correspondence were practical documents. Wills and petitions were more sparse; libels or bills, guild statutes, etc. Chaucer, Langland and the prose translation of the Bible also coincided with this explosion in functional English. English was now being used as Latin had been used. It could be read silently, and privately. Silent reading was also characteristic of the business letter, meant for the reader’s eyes only. Aristocratic children may have learned English at the same time they learned to write Latin. Was English incapable of being employed in 1328 as useful in documents? We do find practical documents written prior to this date – in two recipes. The later of the two is a manuscript of about 1330 containing an insertion from 1350. It was a set of instructions for making pigments for manuscripts. The earlier document was from the 1320’s. The material was designed to teach civilised manners, chivalrous love poetry, hunting tracts and a recipe for almond pudding. The pudding recipe was translated from the French. Both manuscripts contain tracts so the artisan could be instructed orally. It does not indicate some ‘hidden’ monoglot tribe of English speakers. Before 1380, there is no routine documentation in English. Society needed two if not three languages to communicate at this time and English writing was for oral instruction. “It would be fair to say there was a hierarchy of languages in England in 1300”. Latin was the highest of the hierarchy, then French and English. This hierarchy changed in 1450 – literary English was now as prestigious as Latin and could be used to communicate a slew of ideas. Business English was suddenly on the level of practical Latin for records and accounts. “French, though still elegant was on its way to becoming a foreign language”. This was a great paper and I thoroughly enjoyed it. Catto’s presentation was as humourous as it was fascinating. I’m looking forward to more from this series, Medieval Book History Week. If you’re in Toronto, check here for the Pontifical Institute’s calendar of events. We’ll be bringing you more of these awesome “mini-conferences” as often as possible. Stay tuned as we cover, “The Eucharist and the Negotiation of Orthodoxy in the High Middle Ages” this Wednesday, November 14th!